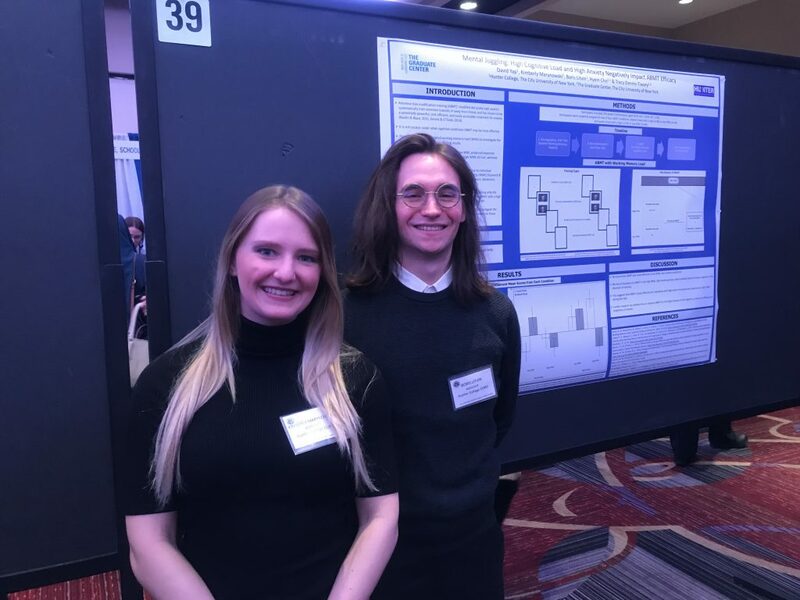 Kim Marynowski and Boris Litvin at the 90th meeting of the Eastern Psychological Association, New York, NY. The aim of this study was to understand how additional factors impact the effect of working memory load on attentional bias modification training (ABMT) efficacy. We examined the effect of working memory load on ABMT, and whether it depends on working memory capacity (WML) and anxiety level. ABMT is most effective in low WML and low anxiety conditions, and is least effective in high WML and high anxiety conditions. Yap, D., Marynowski, K., Litvin, B., Cho, H., & Dennis-Tiwary, T. (2019). Mental Juggling: High Cognitive Load and High Anxiety Negatively Impact ABMT Efficacy. Poster presentation at the 90th meeting of the Eastern Psychological Association, New York, NY. 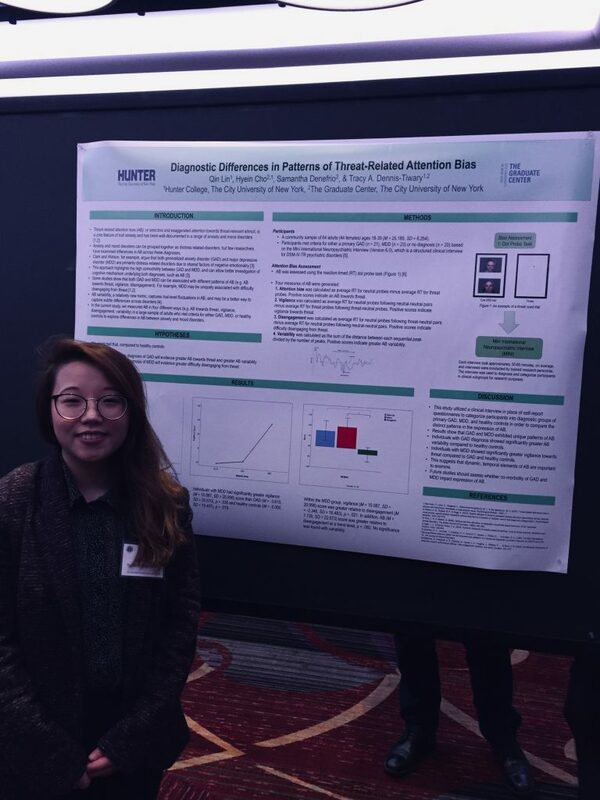 Qin Lin at the 90th meeting of the Eastern Psychological Association, New York, NY. It remains unclear whether GAD and MDD are associated with similar or distinct patterns of threat-related attention bias (AB). We examined diagnostic group differences in patterns of AB in those with a primary diagnosis of GAD versus MDD, and compared to healthy controls. GAD was associated with greater AB variability, whereas MDD was associated with greater vigilance. Implications for the study of attention biases in mood-related disorders are discussed. Lin, Q., Cho, H., Denefrio, S., & Dennis-Tiwary, T. A. (2019). Diagnostic Differences in Patterns of Threat-Related Attention Bias. Poster presentation at the 90th meeting of the Eastern Psychological Association, New York, NY. 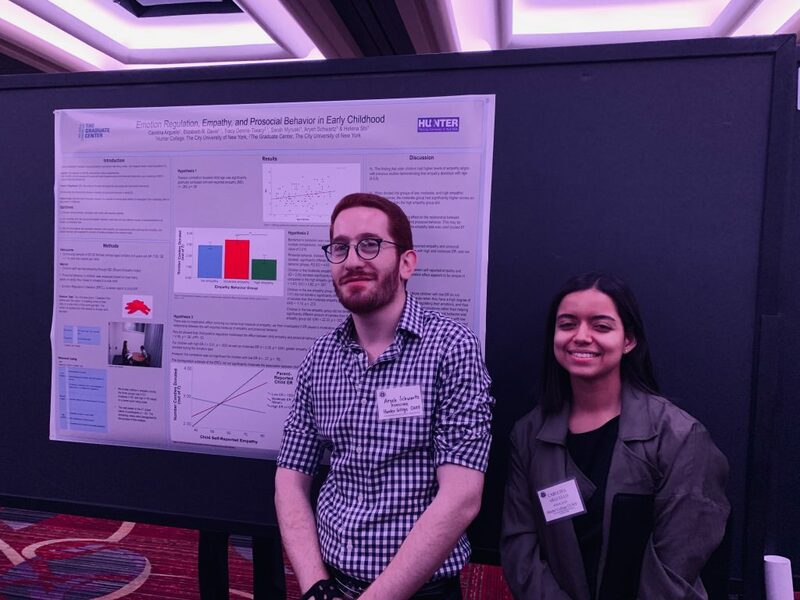 Aryeh Schwartz and Carolina Arguello at the 90th meeting of the Eastern Psychological Association, New York, NY. 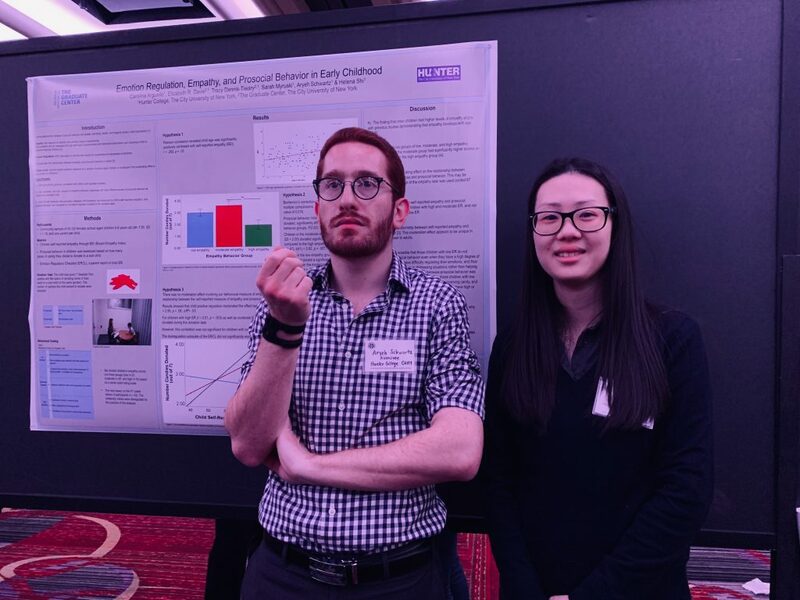 Aryeh Schwartz and Helena Shi at the 90th meeting of the Eastern Psychological Association, New York, NY. Emotion regulation moderates the association between empathy and prosocial behavior in adults. The present study explored this moderation effect in children. Results showed that child positive regulation moderated the effect between child empathy and prosocial behavior. For children with high emotion regulation and moderate emotion regulation, greater empathy predicted significantly more candies donated during the donation task. Arguello, C., Davis, E. R., Dennis-Tiwary, T., Myruski, S., Schwartz, A., & Shi, H. (2019). Emotion Regulation, Empathy, and Prosocial Behavior in Early Childhood. Poster presentation at the 90th meeting of the Eastern Psychological Association, New York, NY.